Does seeing photos of vacationers snorkeling along coral reefs inspire you to learn to do it yourself? With up-close views of sea life and a unique perspective of the ocean, snorkeling gives adventurers and families another way to enjoy the outdoors. 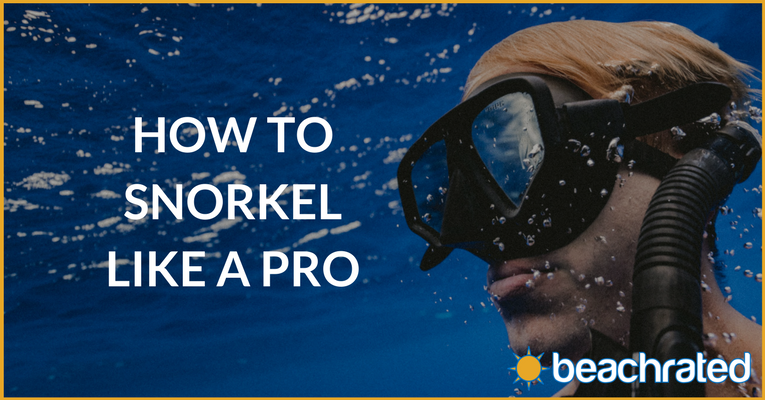 Learn how to snorkel and choose the best snorkeling gear that will have you dipping into the water like a pro in no time. Wetsuits Protect Your Skin & Keep You Warm In Cold Waters! Snorkeling is an underwater pursuit that requires little equipment and little skill to practice. Snorkelers use a diving mask and snorkel to breathe underwater. They typically stay close to the surface of the water. Shallow swimming allows for viewing of wildlife, rock formations, and even wreckage of historic ships. But if you’re new to this form of water recreation, there’s a lot to learn before you jump in. Think back to childhood cartoons like the Looney Tunes, and it seems like the concept of snorkeling has been around a long time. But before cartoon characters were breathing through reeds while hiding underwater, people figured out how to snorkel while diving into the depths. Even Aristotle was familiar with the concept of snorkeling, comparing humans’ breathing equipment to the trunks of elephants. He had the right idea- an elephant’s trunk allows it to breathe as it crosses deep bodies of water. Humans have always taken hints from nature to devise what they need to survive. Hollowing out reeds or other foliage to use as breathing tubes is where the activity began, but it’s hard to tell precisely when we first came up with the idea. Fortunately, today’s snorkeling equipment is a lot safer and more comfortable than using a hollow reed.. High-performance materials and new engineering methods provide form-fitting gear that keeps snorkeling safe and inviting. Breathing with a snorkel requires some acclimation, but in most cases, it’s a simple transition. Still, seeing someone snorkeling completely underwater may confuse you. The snorkel tube is for breathing, so how can people submerge it and not drown? The key is in how you breathe as you go under the water. In most cases, swimmers keep their snorkel tubes above the water. A snorkel tube is a direct line to the surface of the water, and you can breathe through the tube to get fresh oxygen. This way, you can stay underwater for as long as you like and still breathe with ease. But if you want to dive down under the water and keep your snorkel on, don’t think you can keep breathing as you swim down. Although some snorkels feature technology to keep water from seeping in, you still cannot use a snorkel to “breathe” underwater. When swimmers dive under the water while wearing a snorkel, they’re holding their breath. Then when they come back up, they exhale, pushing the water in the snorkel out and clearing the tube so air can flow again. Snorkeling is an accessible leisure activity for most people because it doesn’t take a ton of physical exertion. That said, there are a handful of prerequisites you need to know on how to snorkel before jumping in. This is a requirement if you’re looking to spend time snorkeling instead of trying to survive. Although most snorkeling takes place in shallow water, knowing how to swim is critical. In the ocean especially, currents can pull swimmers outside their comfort zone with little warning. As you snorkel, you must maintain buoyancy to keep water from filling the snorkel tube, so basic swimming skills are helpful for holding yourself steady. People who are unfamiliar with swimming in the ocean may also panic in situations that adept swimmers can easily manage, so getting comfortable in the water is the first step toward successful snorkeling. It should go without saying but being able to hold your breath for at least a few seconds is a helpful skill when snorkeling. For that reason, although it’s a family-friendly activity, children who cannot hold their breath shouldn’t join in. While you may plan to stay close enough to the surface so that you don’t need to hold your breath, there is a chance that your equipment could malfunction or that you’ll need to dive down below the surface. Keep this in mind and always be prepared to hold your breath if necessary until you can reach the surface. Being able to move your body independently is helpful, although modifications can help people of all abilities snorkel with relative ease. This also applies to children who may have basic swimming abilities but not quite understand how to manage their buoyancy and avoid dipping the snorkel tube under the water. Whether you’re snorkeling with a buddy or taking a lesson with a professional, you need to be willing to follow directions to ensure your safety and the safety of others in your group. Before you get in the water, your instructor will likely go over the guidelines for snorkeling with their company or organization, so make sure you heed their advice. Although this guide completely covers how to snorkel, it cannot be a specific guide to the types of waves / area you will be in. Make sure you are being watchful of your surroundings before heading out. And to add – if you’re with friends or family you should consider working out an underwater communication system with them. Simple hand signals like indicating which direction you should go or if you need to surface will help avoid confusion and make your experience more enjoyable. While other water sports often require a specific level of physical fitness, snorkeling is practically a one-size-fits-all activity. Families from preschoolers to great-grandparents can enjoy swimming and sightseeing together without much fuss. Participants don’t need exceptional physical abilities or strength, although some amount of coordination is helpful for moving around in the water. Many people with disabilities can successfully snorkel with slight modifications if any. Although snorkeling is an overall accessible recreational pursuit, there are some limitations as to who should not take part. For example, people with medical issues such as heart conditions or blood pressure problems should consult their doctor before snorkeling. Even someone who has diabetes is at risk while snorkeling if their blood sugar drops or rises to a dangerous level. Therefore, every participant should consider his or her risk factors before deciding whether or how to snorkel. Another consideration concerning people who wear glasses is whether they can wear corrective eyewear with a snorkel mask. In most cases, you will not be able to wear glasses underneath your snorkel mask. However, wearing contacts is an acceptable alternative, if you have them. Still, people who wear contacts while snorkeling should consider that if water gets inside the mask, it can “wash” the lenses out of their eyes. However, for users who wear properly fitting snorkel masks and equipment, that is a rare occurrence. Ultimately, if you wear glasses and are serious about snorkeling as a long-term hobby, you do have the option of purchasing swim goggles with corrective lenses. However, most goggles are not compatible with scuba masks, so shop wisely if you choose to buy corrective lenses in that form. If you have never snorkeled before, you likely have questions about the experience. Here are commonly asked questions and answers about snorkeling. The short answer is that yes, snorkeling is reasonably safe. However, there is always a risk when people partake in physical activity, particularly a water-related one. The highest risks, according to a 2012 study on snorkeling statistics and safety, are drowning and cardiac causes. According to the co-author of that study, snorkeling is a very safe pastime, but people who plan to learn how to snorkel should have a medical checkup beforehand to rule out pre-existing health dangers. People should also be aware of their abilities and their environment, as most of the drowning deaths were of experienced divers who could hold their breath for a long time. How Long Should I Snorkel For? If you stay near the top of the water, keeping your snorkel tube above the surface, there’s no limit to how long you can breathe through a snorkel. However, you should not overexert yourself. Avoid exhaustion and take breaks frequently, especially if you are new to snorkeling or are swimming in a challenging environment. You’ll find that exerting a good amount of force in the water while breathing heavily through a small tube can make you light headed as well. What's The Difference In Snorkeling & Scuba Diving? Snorkeling and Scuba Diving have a few similarities. Snorkeling is a surface activity, while scuba diving involves deeper swimming. Snorkelers use gear such as a mask and fins, while scuba divers often require more advanced diving equipment like oxygen tanks and wetsuits. Scuba divers can use their equipment for snorkeling, as well, but they often take on expeditions in deeper water. Does Snorkeling Harm The Environment? Overall, snorkeling is safe for the environment. The only exceptions are when humans disturb aquatic life such as touching coral reefs or animals. Coral is especially vulnerable to human touch, according to the National Oceanic and Atmospheric Administration (NOAA). NOAA suggests leaving corals and seashells where they stand when you visit and choosing souvenirs from a store instead. You should also avoid touching corals or standing on them, however tempting the photo opportunities may seem. Keeping litter out of the water also helps protect sea life, so make sure you don’t take anything with you when you snorkel, other than perhaps an underwater camera. NOAA also recommends visiting a local dive shop, aquarium, or marine park center where you snorkel to learn more about the local environment. Is It Okay To Snorkel Alone? While it’s possible to snorkel alone, most professionals caution against it. Snorkeling in pairs via the buddy system is a smart option, although exploring with a professional also helps prevent problems. Having a friend along can help you both stay safe and aware of your environment, especially if one of you experiences an injury or another medical emergency. You’re also less likely to panic in a stressful situation if you have moral support on hand. Can I Get Sunburned While I Snorkel? Short answer: YES – and sunscreen your BACK. Because snorkeling takes place so close to the surface of the water, sunburn is a potential danger. Although the water may feel cool on your skin, this can lull snorkelers into a false sense of security. As a result, you can can sustain severe sunburn before they realize what is happening. To keep from ruining your excursion with a painful sunburn, consider wearing a rash guard or other clothing with SPF protection, apply sunscreen liberally and often, and avoid snorkeling when the sun is hottest. Snorkeling is possible practically everywhere. Anywhere with water that’s calm and clear is an ideal place to snorkel, but heed written warnings about trespassing, underwater dangers, or weather conditions. Here are a few considerations on where to go. Children often enjoy practicing their snorkeling skills in the shallow end of a local pool. Adults can get in on the fun, too, and hone their skills for more adventurous exploration. A pool is also a great place to practice breathing techniques and using snorkel fins. Your local pond or lake may also prove a desirable place to snorkel. If the water is clear, you’ll be able to spot local wildlife and other underwater attractions. However, keep in mind that you should still have a buddy while snorkeling, even if it’s on your own property. You can learn to snorkel nearly anywhere there’s water, but most people snorkel in the shallows of the ocean. Crystal clear water and vibrant sea life make seaside snorkeling a memorable experience, and with unique species in every locale, you’ll see something different each time you snorkel in a new place. One way to learn how to snorkel under the supervision of a professional is with inclusive resorts. A resort experience often involves resort-provided equipment, lessons from a pro, and guided tours of underwater locations such as coral reefs or sunken ships. Although snorkeling is often part of a resort package, many places offer lessons and snorkeling experiences to outside guests, too. You may have to travel to find a coral reef to tour, but the primary interest of most snorkelers is seeing colorful coral reefs and their fascinating residents. Even if you live near the ocean, there may not be a coral reef nearby to explore. Although you can find coral reefs in more than 100 countries, according to The Coral Reef Alliance, most are located between the Tropics of Cancer and Capricorn, in the Pacific and Indian Oceans, in the Caribbean and Red Seas, and in the Persian Gulf. But some exist in Florida and Southern Japan, too. Overall, there are around 110,000 square miles of coral reefs on the planet. This barrier reef has 185 miles of coral. Snorkelers will see eels, rays, fish, and even nurse sharks. Although hotels populate the area, monkeys live in the local jungles and stunning blue waters contain turtles, fish, underwater coves, and dozens of shipwrecks. Hawaii is the destination for all things ocean, but the Big Island has more snorkeling square footage than any other. It’s home to an underwater state park and has dolphins, turtles, and tropical fish. The Philippines has over 7000 islands that are home to a diverse ecosystem that ranges from coral reefs to lagoons and more. You can also swim with sharks. A national park with brain coral, three species of sea turtles, endangered pelicans, and terns has shallow and gentle water that’s ideal for even inexperienced snorkelers. Komodo dragons are the primary attraction here, but rays, turtles, 14 kinds of whales, and 260 types of coral delight underwater explorers. Exceptionally clear water and tons of fish, sharks, anemones, coral, and octopi make the Maldives a snorkeling experience to remember. A marine lake that’s full of jellyfish is a snorkeling attraction on this island, but you don’t have to worry about stings. According to local lore, the jellies’ stings don’t hurt because they only eat algae in their home lake. Home to the largest coral reef in the world, Australia beckons with its 1400 miles of coral plus interesting shipwreck sites. The unique volcanic origins of the Galapagos created fascinating underwater scenes where sea turtles, dolphins, orcas, whales, Galapagos penguins, and more put on a show for visitors. As simple as it sounds to get started, it’s impossible to snorkel without gear. From newbies to advanced snorkelers, some tools are non-negotiable, while others are perks that add to the experience. The essentials for the sport include a mask, snorkel tube, fins, and water wear. For your first adventure in snorkeling, you might get away with using a mask with a separate snorkel tube. Think of the type of mask and snorkel you used as a child, with goggles that cover your eyes and your nose but not your mouth. A snorkel set like this works for most kids and beginner snorkelers. However, an alternative is to choose a full face snorkel mask that combines a mask and a snorkel in one piece of equipment. The fadvantages to choosing a full face snorkel mask start with being able to breathe through both your nose and mouth. Full face snorkels do cover the whole face, plus you don’t have to continuously adjust your snorkel tube since the construction of the mask holds it in place. Whatever type of snorkel you choose, it should fit snugly without allowing water to seep inside. You want a snorkel that will stay in place and not flop around as you try to navigate underwater. With a kids snorkel set, focus on fit and the child’s ability to use the face mask and breathing tube correctly. While you could probably get away with snorkeling without fins, they are a helpful accessory that most people find essential. Snorkel fins can help you swim faster, but the focus is control. With fins, you can balance your body in the water and maintain consistent forward movement without much effort. Obviously, you need swimwear anytime you go in the water, but take particular care when snorkeling. Because you’re so close to the surface of the water, sunburn is a considerable risk. Therefore, consider wearing a rash guard or other UV-resistant top and bottom to protect against sun damage. Even wearing a t-shirt over your swimsuit can help limit your skin’s exposure to the elements. Still, sunscreen should also be part of your snorkeling essentials kit. Once you get comfortable in the water with basic equipment, you might consider investing in advanced equipment. Although most of us are familiar with wearing life vests while on the ocean, what about in or under the ocean? Snorkel vests answer the unique challenge of keeping you buoyant enough to keep your snorkel out of the water without propelling you all the way to the surface. For kids and new snorkelers, a vest can mean the difference between an enjoyable swim and a panic-filled one. Especially in rougher water, investing in a snorkel vest can reduce fears and provide a sense of security for swimmers. Snorkel vests are inflatable, meaning you can adjust the air inside depending on your weight and desired buoyancy. However, your vest is also a lifesaving floatation device in emergencies. Most vests come in bright colors and deflate entirely for storage and travel, making them the ideal companion for snorkelers of all ability levels. If you snorkel in mostly warm seas, you may not need a wetsuit. But for snorkelers who plan to travel or whose local ocean is chilly, a wetsuit helps with insulation and comfort. With a wetsuit, you don’t have to worry about swimsuit snags or baggy clothing. Plus, the best wetsuits have sun protection built in. Depending on the material and thickness of your wetsuit, it may also offer protection against ocean hazards like jellyfish stings and nibbling fish. Plus, you’re already prepared if you decide to join in other water sports before or after snorkeling. While it’s not a necessity, many outdoors enthusiasts choose to document their wild adventures with a camera or video camera. Underwater activities are no exception with the availability of waterproof cameras and other tech devices. From truly underwater compatible cameras to pouches for smart devices that keep everything dry, if you want to snap photos or record video while snorkeling, it’s easier than ever. Some snorkel sets are even compatible with the more popular sizes and styles of portable video cameras, so you don’t need to affix a camera to yourself or hold it as you swim. Although it seems tame, there is always some risk involved with snorkeling. But have no fear- that just means you need to be aware of your environment, use the right equipment, and learn about the potential risks. Here’s everything you need to know on how to snorkel safely. If you enroll in a skills course or guided snorkeling tour, the instructor will first show you how to use each piece of equipment. It’s important to be able to fit your mask correctly, breathe through the snorkel tube comfortably, and see clearly through the mask. The mask should seal securely on your face without obstructing your view or pinching your skin. Because people have different head sizes and face shapes, it’s helpful to try masks on in person if you have the option. Always check your equipment before you head into the water, no matter how often you use it. There’s always the potential for loose seals on masks, small holes in the tubing, or damage to snorkel vests, primarily if you don’t use your snorkeling gear often. You should also carry spare parts for your equipment, although those can stay on dry land. Consider packing extra O-rings, clips, and replacement straps so that you can repair gear on the go. Of course, pack any medical equipment that you need such as allergy medicine or an epi-pen if you have severe allergies. When snorkeling with a group or in a guided tour, your guide will make the boundaries of your excursion clear. Depending on how deep and how intense the water is, you may need to stay close to the shore for the safest experience. If you are exploring on your own, know where dangers lie in the water. If you’re practicing in a pond or lake, recognize whether watercraft cruise in the area, what plants and animals are in the area, and whether there are underwater hazards you can’t see before diving in. In the ocean, you should know how to avoid similar hazards such as people on boats or jet skis, strong currents, and dangerous animals such as those that sting or bite. Also, consider that the most common safety warning for aquatic sports cautions against the undertow. The undertow, or rip current, is a channel of fast-moving water that is often unnoticeable to people swimming near it. According to the National Ocean Service, you should try to remain calm and swim parallel to the shore to get out of the rip current. Then you can swim back to land at an angle and avoid the undertow. Part of NOAA’s advice to swimmers caught in the undertow also applies to snorkelers in general. Keeping calm is the best advice anyone can offer when it comes to getting out of dangerous situations. Whether you experience an equipment malfunction, get lost, encounter a dangerous animal, or any other potential hazard, staying calm is preferable to panic. Why? Well you don’t want to be exerting so much force out of panic. You want to be exerting force in a smart way to get yourself to safety. It can be quite scary to get caught in an undertow with no lifeguard on duty and no friends or family around. Fortunately, snorkeling is a lot safer than other water activities. However, the biggest risk is that of drowning, according to the data from cumulative studies. Therefore, snorkelers should not take chances with swimming outside their comfort zone and ability level. One way to reduce the risk of drowning or other adverse events is to pair up when snorkeling. Exploring underwater with another person is not only fun, but it’s also a smart safety tip that can get you out of a difficult situation. If you have unique medical needs such as severe allergies, diabetes, or another pre-existing condition, having someone along who knows you well can minimize your risk. Stick with the buddy system as a “just in case” means of safety. Although the first tenet of snorkeling is to leave the environment the same way you found it, it’s worth repeating that you should never touch sea life. From coral to fish to potentially poisonous creatures, there are dangers to both you and the aquatic critters when you get too close. Some undersea animals have spines or barbs to protect against predators, while others have invisible means of staving off prey. Poison or oily substances can hurt you, but they can also make it difficult for you to see. Keeping your hands off and avoiding startling animals can help keep everyone safe. Also, be aware of the wildlife in the area that you’re swimming in. In many locations, an abundance of jellyfish may mean a risk of stings. Moray eels will often bite when they feel threatened, so avoid peering into their coral homes. When in doubt, ask a local guide or ranger what to expect when it comes to encounters with sea life. Sunburn is uncomfortable and inconvenient, but your odds of burning are higher with snorkeling versus actually scuba diving. The closer you are to the surface of the water, and the clearer the water, the worse off you are after swimming for a few hours without sun protection. To minimize this risk, wear a waterproof sunscreen, cover your skin with a t-shirt, rash guard, or wetsuit, and take breaks in the shade when possible. It’s 2018 now – you can even take a sunscreen pill to avoid getting burned. Many swimmers often overlook the risk of dehydration while snorkeling because after all, you’re in water the entire time. But apart from the fact that you’re likely swimming in salt water, you still need to focus on hydration while partaking in any physical activity. Learning how to snorkel also means learning a new set of skills and techniques for your safety and well-being. Fortunately, there’s plenty of fun to be had, too! We hope our guide on snorkeling was helpful! Do you have any great snorkeling tips to share? Leave us a comment below!